Your air conditioner is meant to cool your home, but it’s not meant to cool itself until it freezes! If you notice ice or frost on the outside of or on the indoor coils of your unit, you have a freezing issue. But what causes this issue, anyway? Here are six reasons your air conditioner is freezing up and what you can do to avoid or solve the problem. Important: If your unit is frozen, begin by turning it OFF (not just adjusting the thermostat up). A frozen AC unit can indicate a serious problem that only gets worse if you continue to run it. Put the unit on the “fan only” setting to help thaw the frost or ice while you’re diagnosing and addressing the problem. Dirty Air Filter: Start by checking your air filter and replacing or cleaning it if it’s clogged or dirty. Keeping your air filters clean helps keep the airflow in your system unrestricted and your unit running smoothly. Restricted Air Flow: A dirty air filter is only one reason your unit may have constricted air flow. After checking the filter, take a look at all the supply registers and return grilles and make sure they’re not dirty, obstructed, or closed. Thermostat Setting: If you’re running your unit at a very low temperature, especially over a long period of time, you can run into a freezing problem. Try adjusting your thermostat to a more moderate setting. Dirty Evaporator Coil: It’s common that over time, your evaporator coil can get dirty and cause problems. 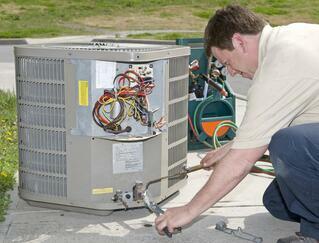 The best recourse is to have your unit regularly inspected and cleaned. But if a dirty coil sneaks up on you anyway, it’s not a simple DIY fix. It's time to call in the pros. Low Refrigerant: Freezing can be caused by a leak in your refrigerant lines. The leak itself can have a number of causes including problems in the joints, valves, and fittings. Regardless of the cause, this is one fix that will need a professional’s attention. Depending on the extent of the problem and the age of your system, your HVAC pro may recommend replacement over repair. Broken Motor: There’s always the possibility of a mechanical breakdown. If your blower motor isn’t running at the right speed — or not running at all — that’s another job for your HVAC professional. Need a trusted HVAC partner? Check out our convenient dealer locator to find a reliable HVAC pro near you.